My eleven-year old son, Zayne, has an adventurous palette and loves to try new foods. As a huge fan of all fish - especially salmon - he begged at the grocery store this week to buy a small package of smoked salmon as we passed the fish counter. When I told him that we had simply ran in to pick up a couple of items, he offered up purchasing the salmon with his own money that he had brought along. Since he is usually pretty careful with his spending, I knew he meant business and must have had a strong desire to bring home the fish. So, I obliged and allowed him to make the purchase. He was so anxious to get the salmon home and try it on some crackers with just a little spritz of lemon. To my surprise, he declared that he really didn't care for it due to the smoky flavor. I, on the other hand, adore smoked salmon and jumped at the opportunity to reimburse him for the fish. Doing so meant that I could make one of my favorite dips! This is a Martha Stewart-inspired recipe that I've adapted to my liking. If you're wondering where to find smoked salmon or about the cost, I believe most grocery stores carry it these days in their refrigerated fish section. A four-ounce portion (the amount needed for this recipe) runs around $5 dollars in the supermarkets here in Michigan. This is a great dip/spread for parties or to nibble on while catching up on some DVR recordings late one night while the rest of the family is in bed (although I wouldn't know anything about that). Place all of the ingredients in the bowl of a food processor - reserving 2 ounces (half) of the salmon. Process until well-combined, but not completely smooth (about 15 - 20 seconds). Transfer to a small bowl and gently fold in the remaining 2 ounces of salmon. 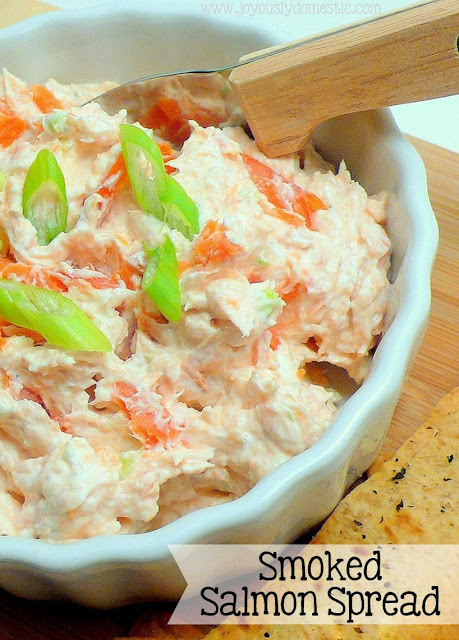 Serve with bagel chips, pita chips or your choice of crackers. Your son sounds awesome! What a cool kid. I imagine my future kids will also be prone to spending allowance money on random food items :) Too bad he didn't like smoked salmon, but I bet he will when he's a bit older. I can't get enough of it. And, the funny thing is that he liked it once I made it into a dip! :) Yeah!